This entry was posted in Firefighters strike, Firefighters strike action, Solidarity, The People's Assembly Derby and tagged Austerity Fight The Cuts, Derby, Derby People's Assembly, Derby People’s Assembly against Austerity, DERBYSHIRE, Fire Brigades Union, Fire Brigades Union FBU, Firefighters Strike, Solidarity. Firefighters in England and Wales are to strike on eight consecutive days in their long-running row with the government over pensions. 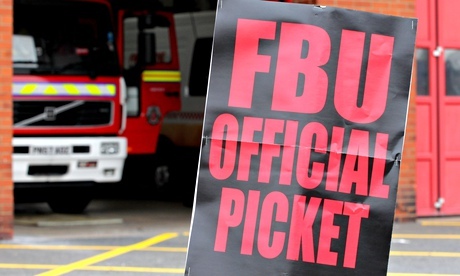 The Fire Brigades Union (FBU) has escalated industrial action, saying that the current proposals on pensions and later retirement age are “unacceptable, unworkable and unrealistic”. Strikes will take place between 14 July and 21 July. The FBU has been in negotiations with the government for three years in an attempt to avoid the implementation of proposals that it says would see firefighters paying more, working longer and receiving less. Matt Wrack, the general secretary, said: “The government must realise that firefighters cannot accept proposals that would have such devastating consequences for their futures, their families’ futures, and the future of the fire and rescue service itself. “We have tried every route available to us to make the government see sense over their attacks. Three years of negotiations have come to nothing because the government is simply unwilling to compromise or even listen to reason despite a huge amount of evidence showing their planned scheme is unworkable. This entry was posted in Austerity in UK, Fight the Cuts, Firefighters strike, Firefighters strike action, Inequality, Solidarity, The People's Assembly Derby, X Conservative Party Paymasters and tagged Austerity Fight The Cuts, Derby, Derby People's Assembly, Derby People’s Assembly against Austerity, DERBYSHIRE, Derbyshire Firefighters Strike, FBU, Fight Austerity, Fire Brigades Union, Firefighters, Firefighters Strike, pensions, Solidarity, Solidarity. FBU. Stop the cuts to Fire and Rescue. This entry was posted in Firefighters strike, Firefighters strike action, Solidarity, The People's Assembly Derby and tagged Austerity Fight The Cuts, Derby, Derby People's Assembly, Derby People’s Assembly against Austerity, DERBYSHIRE, Fight Austerity, Fire Brigades Union, Firefighter, Solidarity. Why are #firefighters on strike? The Fire Brigades Union has made a short film explaining why firefighters are on strike over pensions. A 24-hour strike — the longest yet in the three-year campaign — will take place from 9am on Thursday 12 June, with another set for 10am-5pm on Saturday 21 June. In the clip, representatives from the union discuss how the government’s proposals on pensions would affect members if implemented. This entry was posted in Austerity in UK, Fight the Cuts, Firefighters strike, Firefighters strike action, Inequality, Solidarity, The People's Assembly Derby and tagged Austerity Fight The Cuts, Derby, Derby People's Assembly, Derby People’s Assembly against Austerity, DERBYSHIRE, Fight Austerity, Fire Brigade Union, Fire Brigades Union, Firefighters, Firefighters Strike, pensions, Solidarity, strike. his film is radical. With over a dozen NHS insiders as my witnesses, I will tell the alarming story of how the health service as we know it is being quietly abolished. Almost without our noticing, it’s been replaced by a system modelled on the US in which care is delivered by profit-maximising companies that charge patients for treatment which is anyway to be restricted and reduced. One medical reporter the filmmaker knows claims that health reporting today is so poor because few journalists have real sources inside the NHS. Well, this film will have a riot of medical sources – including one professor, two consultant radiologists, a cancer expert, a public interest lawyer, and several outspoken GPs. What they all have to say will be shocking, unusual and brave. Our doctors will really strike back in this one. I will shine a torch on what some doctors see as a glaring omission in the national psyche. I have identified a powerful group of figures within the NHS who are alarmed by the public’s lack of awareness about the abolition of their NHS. This film will follow their arguments right the way up to the Health Secretary’s relinquishing of responsibility for the nation’s health, and will argue that it must be reversed. This film also takes you on a personal journey to a national theme that has massive implications for us all. It will reveal a hidden agenda that’s already having disastrous effects. According to one senior consultant: ‘It’s like putting Dracula in charge of the blood bank’. Each of the insiders will speak to us intimately, as if we’re patients in the consulting room. It will be clear that these doctors are people simply doing their jobs by putting their patients’ interests – which are also the viewers’ interests – first. What perhaps will surprise us most is how efficiency and quality will drop. Or, perilously, how close we are to falling forever down a pitiless US-style empty well of no-bucks-no-care. Though the diagnosis remains bleak, the strength of the characters at the film’s disposal should give us surprising hope, casting flashes of light across an otherwise bleak landscape. The style of the film is intimate, hand-held scrupulousness. Interviews will take place in discreet corners of hospitals, surgeries and streets, the images at times elevated by a powerful soundtrack, leaving the viewer with an overall admiration for the doctors’ speaking out, combined with anger at what’s happening. This entry was posted in Austerity in UK, Defend NHS, Fight the Cuts, Inequality, LibDems Quislings, Save the NHS, Solidarity, The People's Assembly Derby, X Conservative Party Paymasters and tagged Austerity Fight The Cuts, Derby, Derby People's Assembly, Derby People’s Assembly against Austerity, DERBYSHIRE, Fight Austerity, Fire Brigades Union, KEEP OUR NHS PUBLIC, NHS SOS, Solidarity, STOP NHS PRIVATISATION, STOP PRIVATISATION OF THE NHS DERBY. David Price, former senior civil servant and historian of radical movements, will take us through ‘The Spirit Level’, the ground-breaking book by Professors Richard Wilkinson and Kate Pickett, which demonstrates the damaging effects of inequality in modern Western societies. More equal societies almost always do better. Is Inequality the Root of All Evil? This entry was posted in Inequality, The People's Assembly Derby and tagged Austerity Fight The Cuts, Derby, Derby People's Assembly, Derby People’s Assembly against Austerity, DERBYSHIRE, Everybody David Price, Fight Austerity, Fire Brigades Union, Kate Pickett, Professors Richard Wilkinson, Radio Derby, senior civil servant, Solidarity, The Spirit Level. Comments (24)FIREFIGHTERS in Derbyshire will take to the picket line next week in their continuing row over pensions and retirement ages.Members of the Fire Brigades Union, or FBU, have announced they will be taking further strike action on Friday, May 2; Saturday, May 3; and Sunday, May 4. The Government wants firefighters to work up to 60, an age the FBU says is too old for such physical work. This entry was posted in Austerity in UK, Fight the Cuts, Firefighters strike, Inequality, Solidarity, The People's Assembly Derby and tagged Austerity Fight The Cuts, Derby, Derby People's Assembly, Derby People’s Assembly against Austerity, DERBYSHIRE, Derbyshire Firefighters Strike, FBU, Fire Brigades Union, Firefighters, retirement ages, Solidarity.